Born in the province of Shaanxi China, Qiu Xia He has had two notable careers in music: as a performer and teacher back home, and then as performer, composer, producer and teacher in Canada since 1989. At thirteen, she became a professional pipa player. With intense determination, she overcame all competition and went on to study at the Xian Music Academy where she became an instructor after graduation. 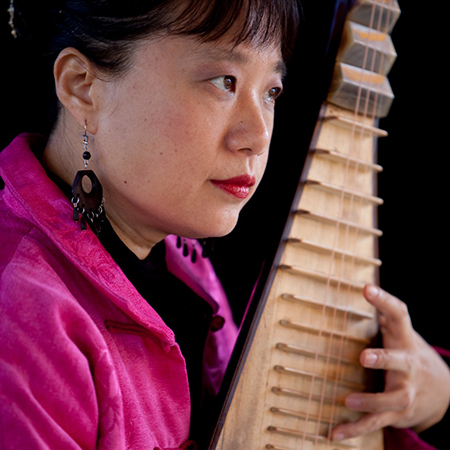 Qiu Xia has made friends all across the continent, and delighted audiences around the world. She has been a featured soloist with the Vancouver Symphony, and a few other orchestras. She has performed with many top musicians around the world and still actively participates in the music scene. As an artist, Qiu Xia has forged her own stamp on the world music stage. She leads groups like Silk Road Music and Joutou, and earned twice a West Coast music award for her CDs: Endless and Village Tales, and her CD Autumn Cloud has garnered exciting responses from the CBC and other media, concert presenters and thousands of audiences. It was nominated in two categories at the Canadian Folk Music Awards. The last CD Standing Out is a statement of her vision to extend the traditional Pipa. As an educator. Qiu Xia has toured in schools and colleges for the last 25 years. Her intention of introducing Chinese music to the public has been more than well received through her Village Tales project. The CD and Booklet has become a favourite Chinese music source for libraries, students, musicians, and folk music lovers. She has been an Artist in Residence for the Vancouver school board, Learning Through Arts of Royal conservatory of Canada, Britannia World Music Program and continually working as private teacher and performer for Artstarts Vancouver, Prologue to the Performing Arts of Ontario. Qiu Xia is consistently pushing boundaries and taking traditional Chinese music into the Canadian Mosaic. Her artistry has demonstrated the potential of music as both the expression of a culture and a powerful link between communities. 秋霞以热爱琵琶音乐为教学动力，在北美众多教育中心担任工作：俾诗 省温哥华教育局Artists in Residence, 加拿大皇家音乐学院 Learning Through Arts, Britannia World Music Program, 温哥华Artstarts, 安大列省 Prologue to the Performing Arts of Ontario，温哥华交响乐团中国音乐学校 VSO School of Music.